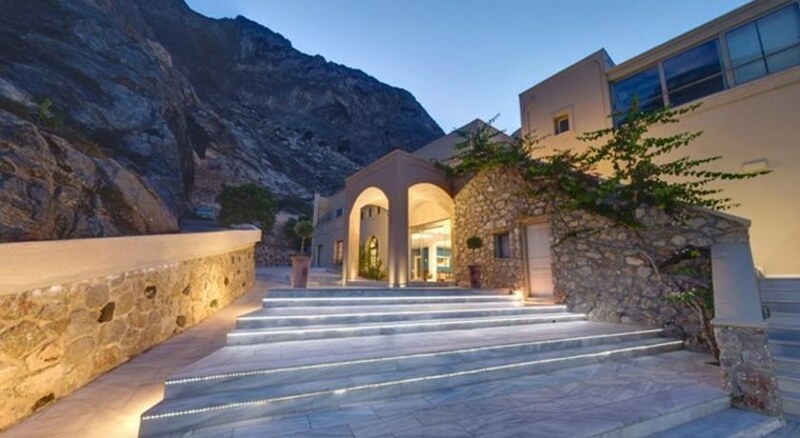 The Antinea Suites and Spa Hotel is a 4-star luxury hotel in Santorini Island, Greece. 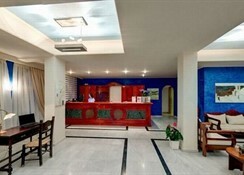 The hotel is set against the backdrop of Kamari Beach of the Aegean Sea and the hillside. The Kamari Beach is located just 400m away from the hotel. The hotel features two outdoor swimming pools. It has 46 tastefully decorated guestrooms. The modern luxury hotel has a décor with elements of traditional Cycladic architecture. The hotel offers all modern-day luxury facilities like Jacuzzi, hot tub, indoor heated pool, among others. The hotel’s location guarantees the vacationers a peaceful beach holiday. The property’s proximity to the town of Kamari makes it a great destination for vacationers looking for a beach holiday as well as experience the culture and heritage of Greece closely. The Antinea Suites and Spa Hotel is located 6.2km away from the Santorini International Airport. The closest beach, Kamari Beach, is just 400m away from the property. The town of Kamari is located 1km away from the hotel. Also, the ancient Thira is located 3.6km away from the hotel. The Akrotiri Excavations is located 14km away from the hotel. The Archaeological Museum of Thera is located at a distance of 9.8km from the hotel. There are multiple restaurants, bars and taverns are located at a distance of 1-2km away from the hotel. The hotel staff can arrange a rental car for their guests for their local outings, and airport pick-up and drop off. All the rooms are equipped with essential amenities including minibar, satellite TV, telephone, radio, among others. The bathrooms are also equipped with all important amenities like hairdryers, bath linens, and essential toiletries. The rooms are regularly maintained by the house keeping staff. 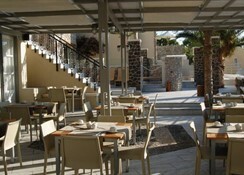 The Antinea Suites and Spa Hotel houses a restaurant that serves a variety of international and local Greek cuisines. The onsite restaurant is popular for its American buffet breakfast. The restaurant also serves food in various options like full English, Irish, continental, vegan, gluten-free and vegetarian. There is also a poolside bar on the property premises that serves a wide range of local wines and signature cocktails. As a welcome gift, the hotel offers the guests a bottle of wine, fruit basket and a bottle of water. The hotel’s proximity to the Kamari Beach allows the guests to try out multiple restaurants and bars that serves local as well as international cuisines. The Antinea Suites and Spa Hotel houses two outdoor swimming pools and pre-heated indoor swimming pool, that serve as a great spot for the guests to indulge in pool games. The hotel also has a poolside bar for the guests who would like to enjoy the poolside with some alcoholic beverages. The hotel also has an in-house spa and where the guests can have a great time and pamper themselves. The proximity of the beach allows the guests to enjoy water sports like snorkelling, horse riding, diving, hiking, etc. Vacationers looking to spend some leisure time can also try sunbathing at Kamari beach, which is 400m away from the hotel.